Cherrypicking – A Comment On The Atlantic Article “Now This Is Interesting: A Climate Prediction From 1981” By James Fallows | Climate Science: Roger Pielke Sr.
Hi all, Simply put — a more convincing case could not be made. This should be front page news. There is always room for doubt, and alternate hypotheses, and science allows one to be wrong — but this case is made with one simple figure. by James Fallows of the Atlantic and the figure is at the top of this post. 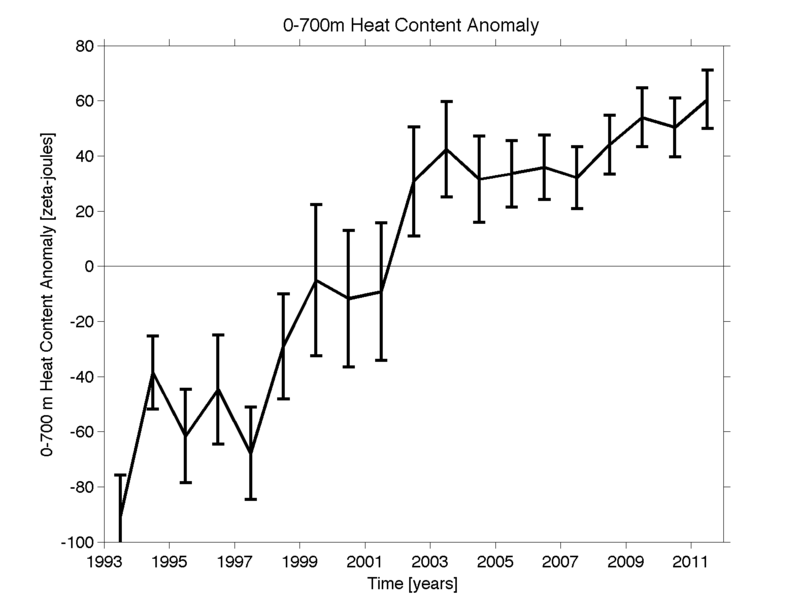 If the observed surface temperature data used in the figure in which this claim is made is correct, but also so is the measurement of lower tropospheric temperatures (such as from MSU RSS and MSU UAH), than Hansen’s forecast for the surface temperatures would be correct, but for the wrong reason. If the warming were due to added CO2 and other greenhouse gases, the lower tropospheric temperatures would have warmed at least as much. However, the latest available global average lower tropospheric temperature anomaly (see) is only +0.11 C above the 30 year average. Over this time period, the Hansen figure shows an expected change anomaly of ~+0.5c. The trend has also been essentially flat since 2002. 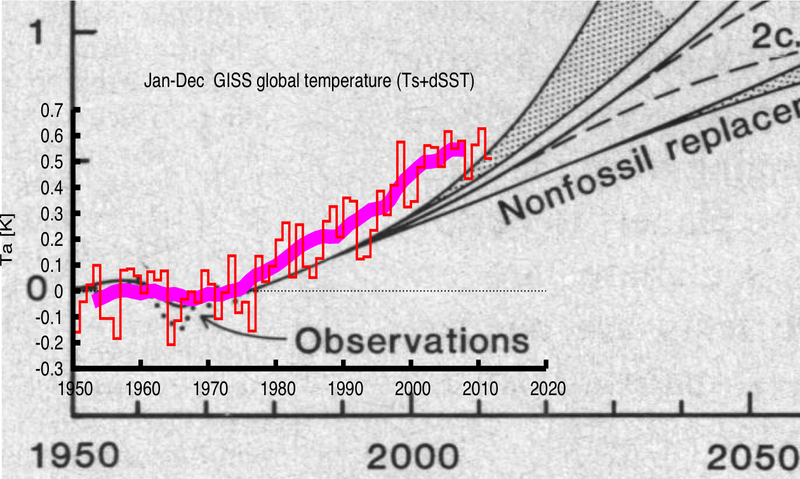 The Hansen figure indicates the current change since 2002 should be almost +0.2C. These discrepancies clearly show the Atlantic article did not objectively look into the Hansen prediction. The lower tropospheric temperature anomaly analyses, therefore, need to also be compared with the Hansen model predictions. That was not done for the article. These two real-world analyses are reproduced below for the period of record. If one wants a convincing figure to show that there should be concern about adding CO2 into the atmosphere, we only need the Mauna Loa Observatory data. Even more important, the lower troposphere does not show the same trend, particularly in the last 10 years. R. S. Knox, David H. Douglass 2010: Recent energy balance of Earth International. Journal of Geosciences, 2010, vol. 1, no. 3 (November). doi:10.4236/ijg2010.00000. which shows a complex pattern of both warm and cool anomalies, but little long-term trend. The Atlantic article is quite deficient in presenting all of the real world data. The conclusion is that the Atlantic article by James Fallows an incomplete and biased news report.